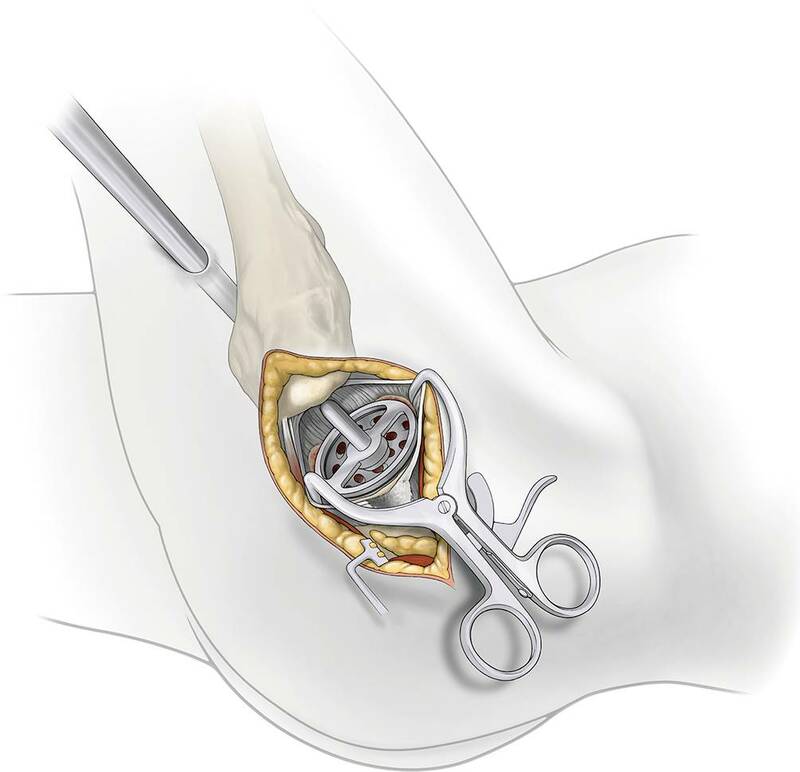 Portal assisted minimally invasive total hip arthroplasty without dislocation of the femoral head with preservation of the hip capsule and the external rotators in the lateral decubitus position for rapid recovery with the option of expandability to a mini posterior or classic posterolateral approach at any time. Primary and secondary arthritis of the hip, femoral head necrosis, femoral neck fracture. Severe anatomical disorders of the proximal femur, congenital high hip dysplasia, implanted hardware in the trochanteric region, local and systemic infections. Lateral decubitus position, skin incision of 6–10 cm from the tip of the greater trochanter in line with the femoral axis, spread gluteus maximus, using the interval between the piriformis tendon posterior and gluteus minimus/medius muscle anterior, incision of the capsule, remove bone of the lateral neck and head, intramedullary reaming and broaching of the femur, osteotomy of the femoral neck with the femoral broach left in situ, remove the femoral head, preparation of the acetabulum using a cannula posterior of the femur, cup impaction and implantation of the inlay, trial modular neck and head, reposition, test of leg length, impingement and stability, x‑ray, implantation of the definitive components, closure of the capsule, standard wound closure. Full weight bearing as possible, no restrictions of postoperative movement. The first 150 patients were operated from January 2016 to July 2017 without leg length discrepancy more than 5 mm; one transfusion was needed. There were two subluxations, one wound dehiscence and one femoral diaphyseal fracture 4 weeks after surgery. There was no radiological loosening of the components after a mean of 16 months. 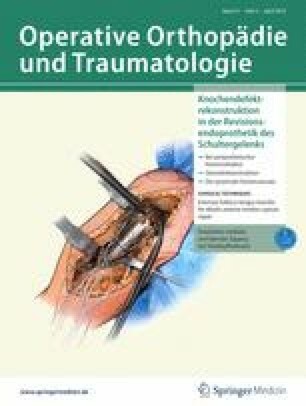 Portalassistierte minimal-invasive Implantation von Hüftendoprothesen ohne Hüftkopfluxation mit Erhalt der Hüftgelenkkapsel und der Außenrotatoren in Seitenlage für eine schnelle Mobilisation mit der Option der Erweiterbarkeit in einen posterioren Mini- oder klassischen posterolateralen Zugang. Primäre und sekundäre Coxarthrose, Femurkopfnekrose, Schenkelhalsfraktur. Erhebliche anatomische Fehlstellungen des proximalen Femur, kongenitale hohe Hüftluxation, einliegendes Osteosynthesematerial am proximalen Femur, lokale und systemische Infektionen. Seitenlage, Hautschnitt kranial des Trochanters von 6–10 cm Länge in Verlängerung der Femurachse, Inzision der Faszie des M. gluteus maximus und Spreizen der Muskelfasern, Eröffnen der Bursa am Hinterrand des M. gluteus medius, Nutzen des Intervalls zwischen der Piriformissehne dorsal und den Mm. gluteus medius und minimus ventral, Kapselinzision, Markraumeröffnung, Entfernung von Knochen am lateralen Kopf und Schenkelhals, Aufraspeln des Markraums bis zur geplanten Größe, Schenkelhalsresektion bei Belassung der Schaftraspel im Femur, Entnahme des Hüftkopfs, Präparation der Hüftpfanne durch eine Arbeitskanüle für die Bohrwelle dorsal des Femurs, Implantation der Hüftpfanne mit Inlay, Einsetzen von Probehals und -kopf, Probereposition, Überprüfung auf Beinlänge, Luxationsgefahr und Impingement, Durchleuchtung, Implantation des Originalschafts und -kopfs, Kapselverschluss, Wundverschluss nach Standard. Die ersten 150 Patienten wurden zwischen Januar 2016 und Juli 2017 operiert. Eine Beinlängendifferenz von mehr als 5 mm trat nicht auf. Eine Transfusion war notwendig. Es traten zwei Subluxationen und eine Femurfraktur 4 Wochen postoperativ auf. Alle Komponenten sind fest eingewachsen bei einer durchschnittlichen Nachuntersuchungszeit von 16 Monaten. 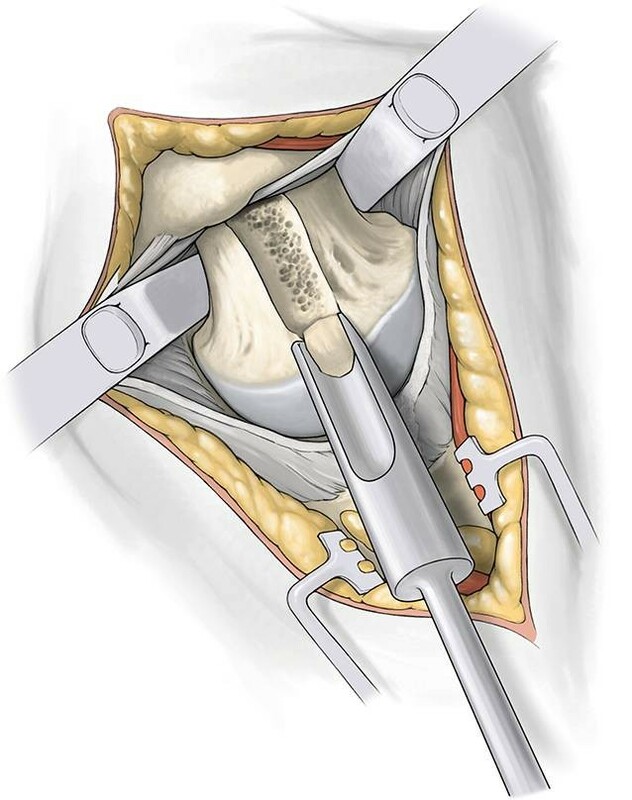 Total hip arthroplasty usually requires dislocation of the femoral head for osteotomy of the neck. 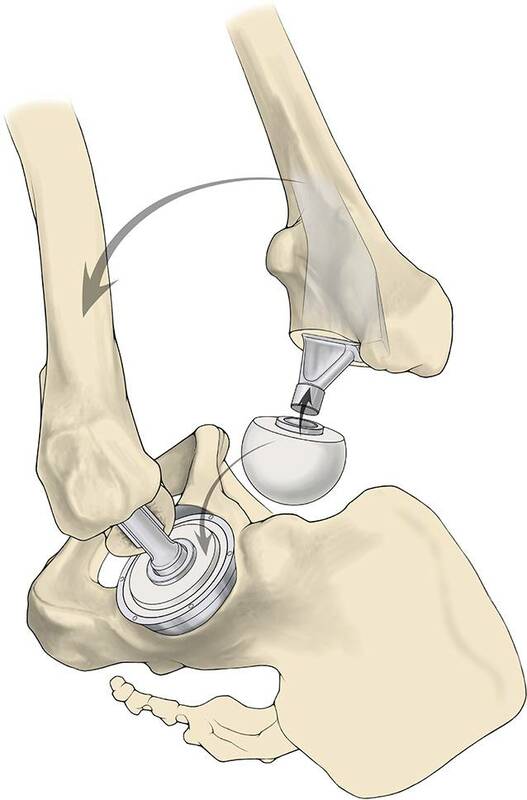 This may lead to rupture of the external rotators in techniques with internally rotation of the femur as it is necessary with a classic or minimally invasive posterior approach . 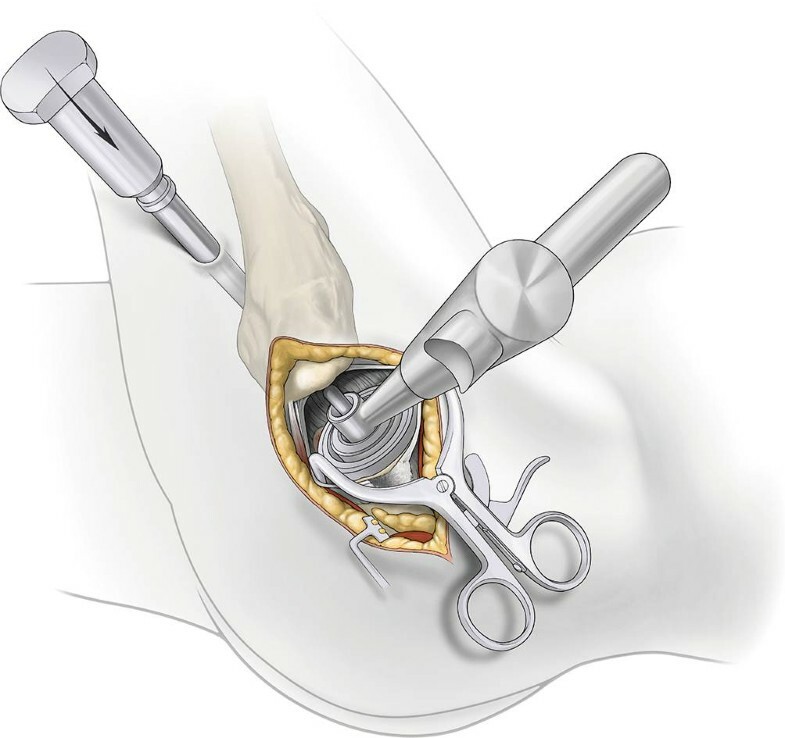 With this minimally invasive technique it is possible to keep the femoral head and neck during the femoral canal broaching. The external rotators are preserved as well as the hip capsule. There are no unphysiological movements of the leg necessary. The technique was first described by Chow et al. . This technique allows early mobilization with full weight bearing without restriction of movements. 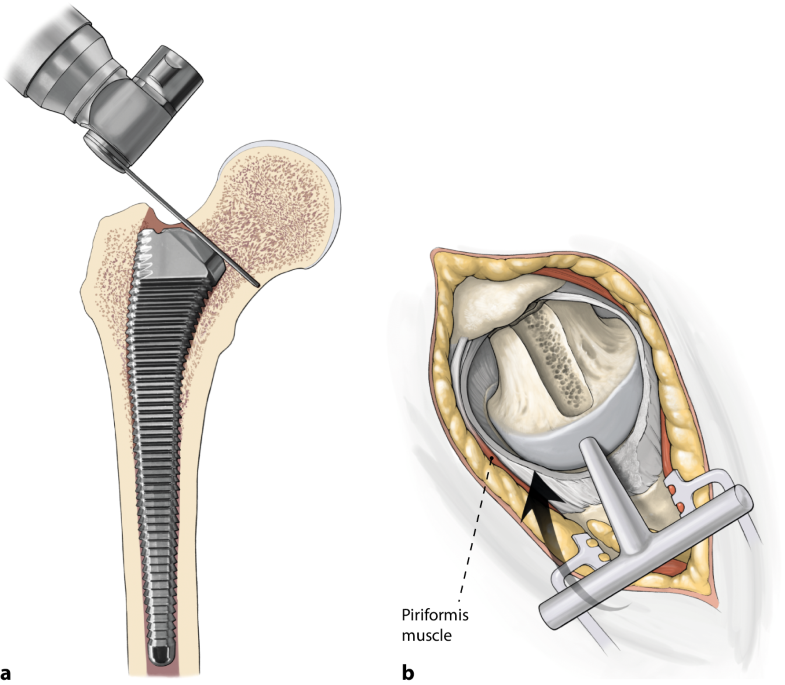 Implantation of a total hip arthroplasty with a muscle sparing minimally invasive approach without dislocation of the femoral head with preservation of the capsule. Lateral decubitus position, skin incision of 6–10 cm from the tip of the greater trochanter in line with the femoral axis, incision of the fascia of the gluteus maximus muscle, blunt dissection of the fibers, incision of the bursa at the posterior boarder of the gluteus maximus muscle, using the space between the piriformis posterior and the gluteus minimus and medius muscle anterior, incision of the capsule, opening of the femoral canal with a starter reamer, creating a channel in the corticalis of the lateral neck up to the lateral part of the head with a round calcar punch, sequentially broaching of the femur, osteotomy the femoral neck at the tip of the femoral broach left in situ, removal of the femoral head, preparation of the acetabulum, use of a cannula posterior of the femur to pass the reamer drive shaft, connecting the acetabular basket reamer through the main incision, cup impaction and implantation of the inlay, trial modular neck and head, reposition, intra-operative radiograph, test of leg length, impingement and stability, implantation of the definitive components, closure of the capsule, standard wound closure. 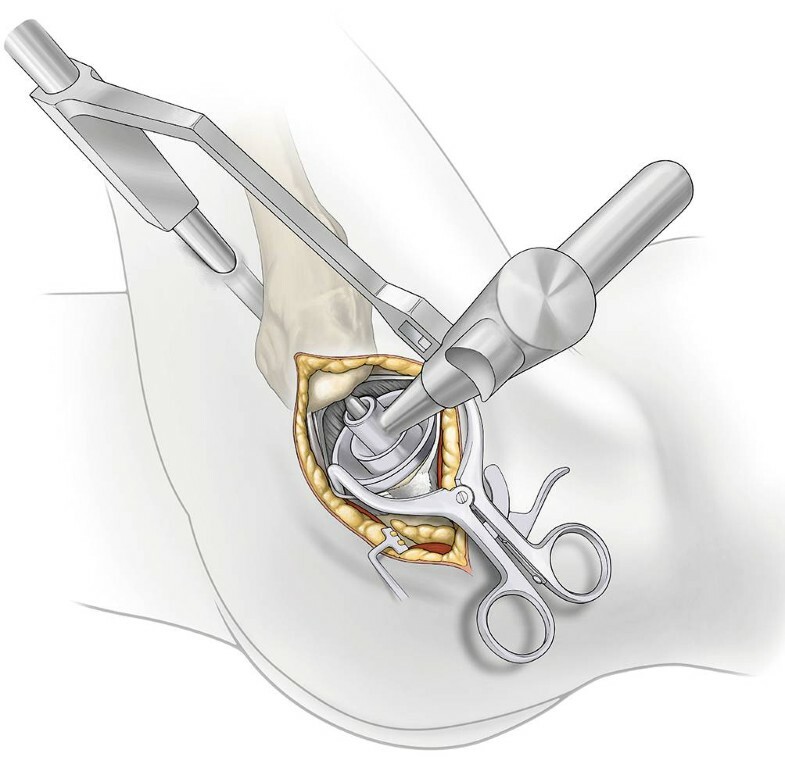 Instruments for preparation of the femur and the acetabulum and implants required from Microport Orthopedics (MicroPort Orthopedics, Inc., Arlington, TN, USA). Uncemented and cemented implants can be used. (Figs. 2, 3, 4, 5, 6, 7, 8, 9, 10, 11, 12, 13, 14, 15). (Figs. 5, 6, 7, 8, 9). The wound is irrigated and checked for bleedings. Closure of the capsule with a running suture or single stitches. 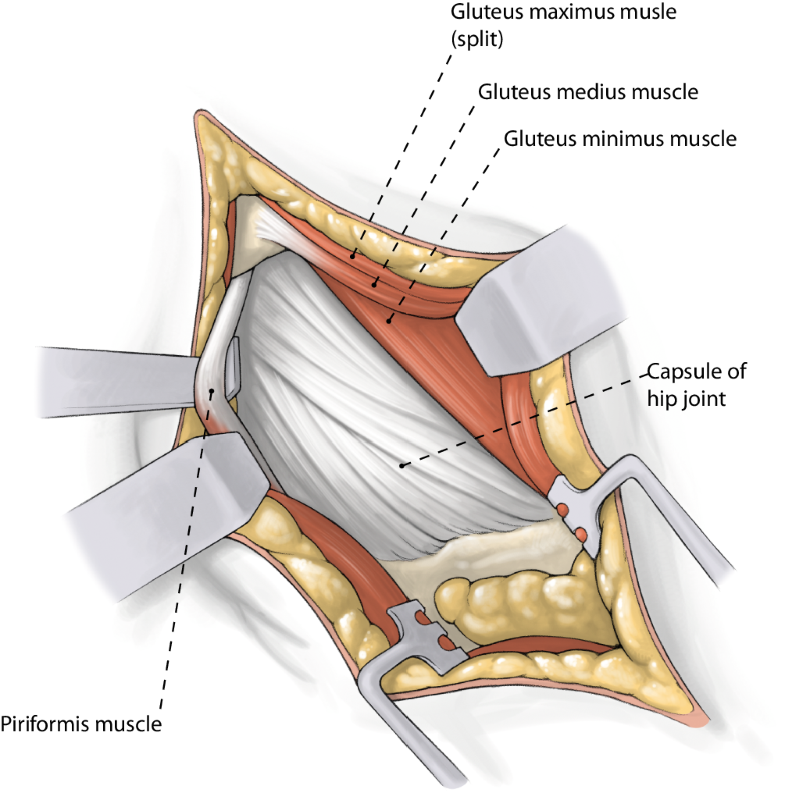 Reattachment of the piriformis tendon at the posterior border of the gluteus medius if release was necessary. No drain necessary but possible. Closure of the gluteus maximus fascia. Routine closure of subcutaneous tissue and skin. Spica for compression of the wound possible. Final x‑ray in a supine position is recommended before the patient leaves the operating room. In our experience, this approach was beneficial for obese patients. 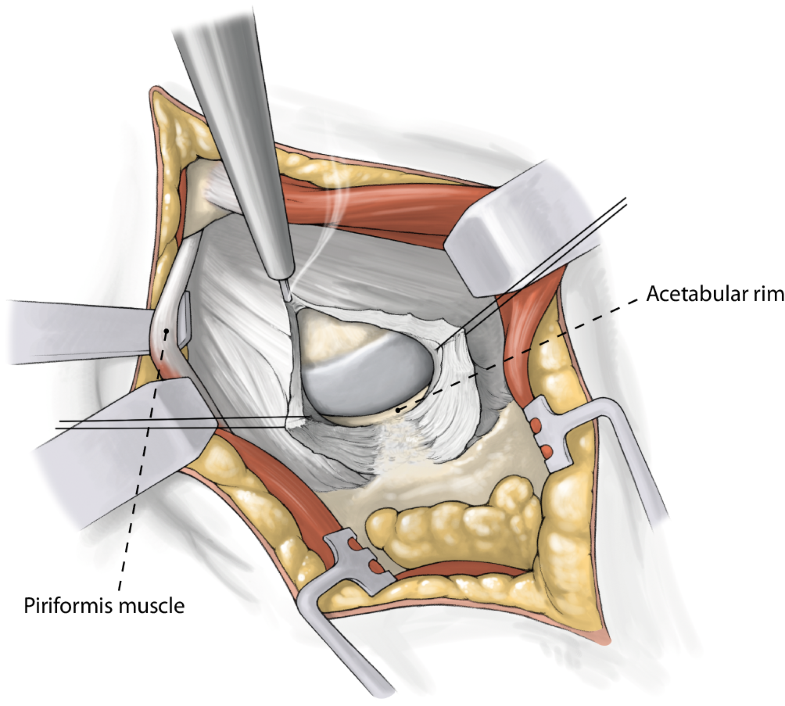 There is not necessarily a need for a very long incision because the procedure is done in a “slot” with a minimal dissection of subcutaneous tissue. Treating patients with a very stiff hip, it may be difficult to get the internal rotation as it is described above. In those cases, tilting the pelvis to get more adduction for the approach is helpful. There should be a space between the lateral boarder of the acetabulum and the medial part of the trochanter to pass the femoral broaches. This can be difficult for patients with a protrusion or a short (varus) neck. After preparation of the femur, return to a straight position for the acetabulum, essential for a correct positioning for the cup. Another possibility is to do a release of the capsule on the femoral side as well as on the acetabulum. Nevertheless, in most of the cases the closure of the capsule is possible. Removal of all osteophytes at the anterior boarder of the neck is essential to prevent impingement especially in patients with a short neck. Monolithic, modular, or cemented implants may be used according to the planning and personal or preferences. 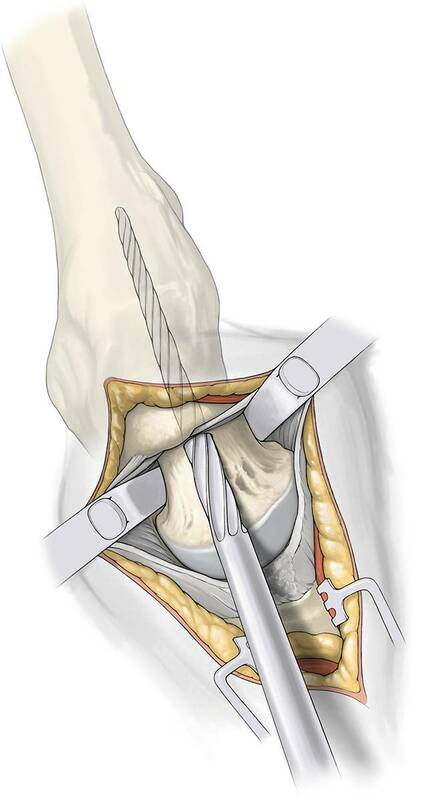 In case of femoral neck fracture, it is also possible to use this approach leaving the femoral head in situ until preparation of the femur is finished. 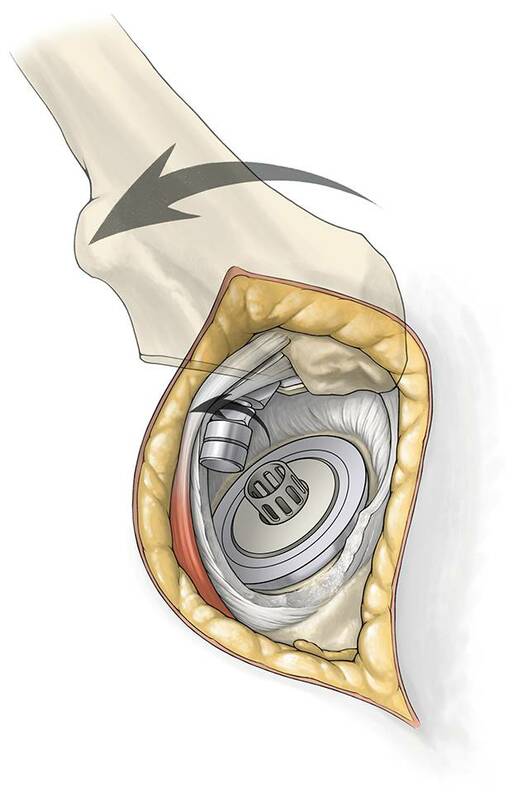 There is one publication about using the SuperPath approach for hemiarthroplasty . With increasing experience, this approach can also be used for revision cases. There is the option to release the dorsal capsule or the external rotators at any time to extend the field of vision of the femur as required. Damage of the sciatic nerve: immediate release of any wound dressing, computed tomography for exclusion of hematoma and revision if needed. 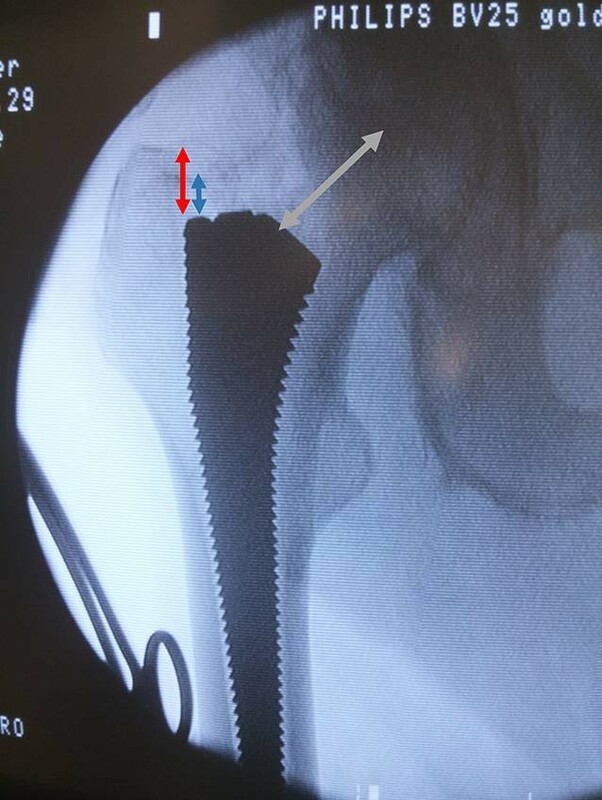 From January 2016 to July 2017, a total of 150 patients were treated with cementless total hip arthroplasty because of osteoarthritis of the hip. The average age at surgery was 69 years (range 39–86 years, 98 women and 52 men) and the average body mass index was 27 (range 17–48). The operative time was overall 81 min (range 58–121 min) declining from the first 50 patients (89 min) to the last 50 patients (75 min). There was a prospective follow-up. The inclination angle was at 39.3 (range 28–50) and there was no leg length difference more than 5 mm. The mean anteversion angle measured at a standard supine anteroposterior pelvis view was at 17.1 (range 6.2–31.9, SD 4). 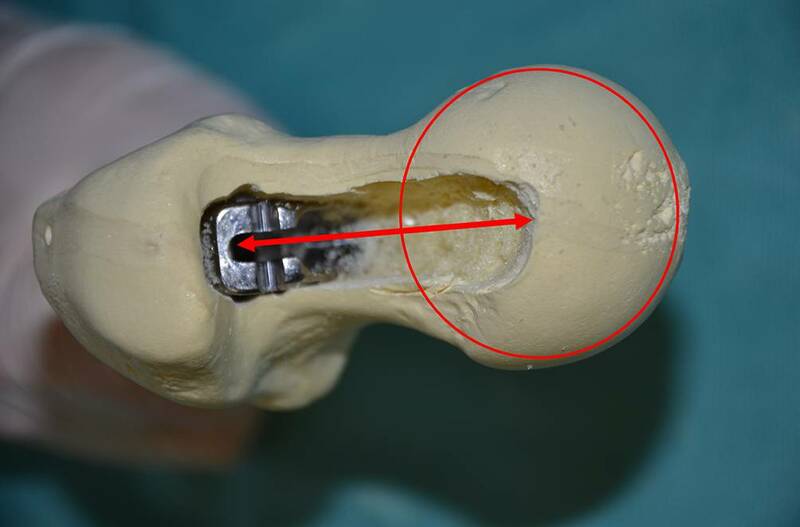 The position of the stem was 0.17° varus (range 2.7 valgus to 3.3 varus, SD 0.9) measured between the stem axis and the long axis of the femur (Fig. 16). Postoperatively all the patients were mobilized early and discharged at day 9.9 (due to regulations of the hospital). Most of the patients were able to leave the hospital earlier. Surgical complications occurred in 4 patients but only the first was related to the surgical technique. There were two subluxations: in case number 4 three weeks after surgery during elevated sitting. This woman with a body mass index of 34 underwent a closed reduction and is doing fine one year after surgery. The second subluxation in patient number 6 occurred in the operating room after turning the patient onto the back. This required immediate exchange of the head to a longer one. This demented patient walked without crutches after a few days without any complaints. In both cases there was no complete dislocation because the head was captured by the closed capsule. We encountered one wound dehiscence in case 32 in a woman with a body mass index of 48 which required a new skin closure in the operating room at day 8. This was related to a new skin suture technique and not to the approach. One patient who was 78 years old (case 132) was retransferred from the rehabilitation clinic after 4 weeks because a femoral diaphyseal fracture required cerclage wiring of the femur and exchange of the stem. 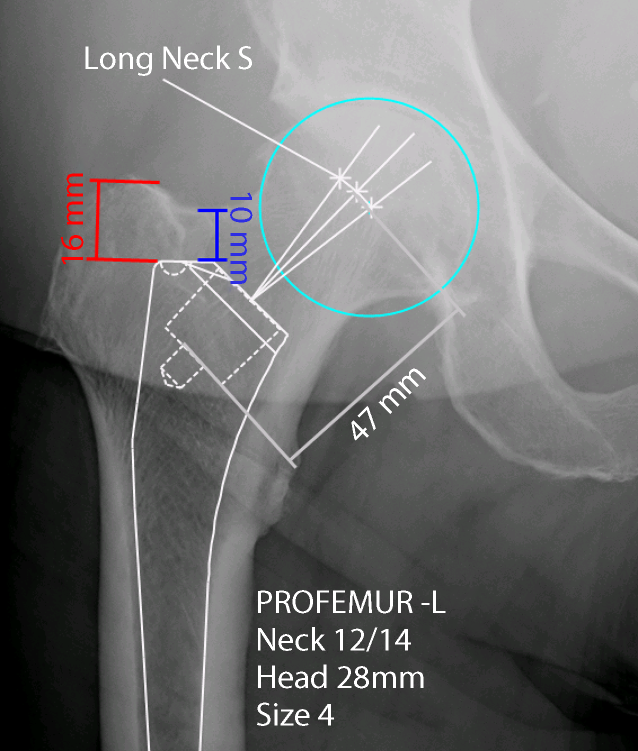 The radiologic data are similar to a short published study with a cup abduction angle of 43.6 ± 6.5, a cup anteversion angle of 17.4 ± 1.8 and a neutral stem alignment with no outliers of more than 5° . The operative time was longer with 103.6 ± 11.8 min and the length of stay (8.3 days) was comparable. We measured the operative time including all patients starting from the beginning. Rasuli and Gofton compared their first 50 patients with the PATH technique [5, 6]. 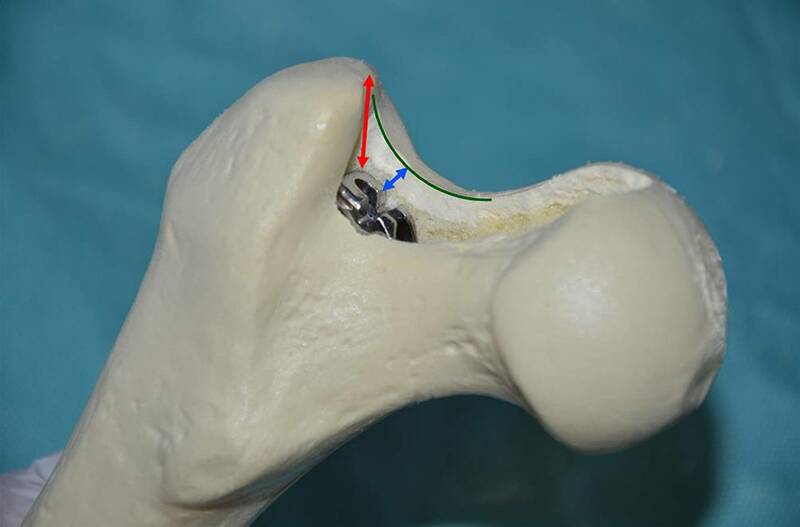 They had an operative time in the SuperPath group of 101.7 min (SD 18.3), a complication rate of 4%, an acetabular abduction angle of 39.0° ± 8.4°, and an anteversion angle of 23.5° ± 8.2°. The anteversion angle was higher in the SuperPath group than in the PATH group requiring more use of the transverse acetabular ligament as a guide to reduce this effect . In another study postoperative radiographs of 66 consecutive patients from the first 100 patients were measured. They found a mean acetabular abduction angle of 40.13° ± 6.30° . In a smaller series of the first 21 patients, the average operating time was 102.85 min (range 80–130 min). The mean acetabular inclination was 44.05° (26–60°) . The results of another study showed similar results with a low complication rate and excellent patient satisfaction . H. Quitmann is a consultant for MicroPort Orthopedics for surgical observation services.